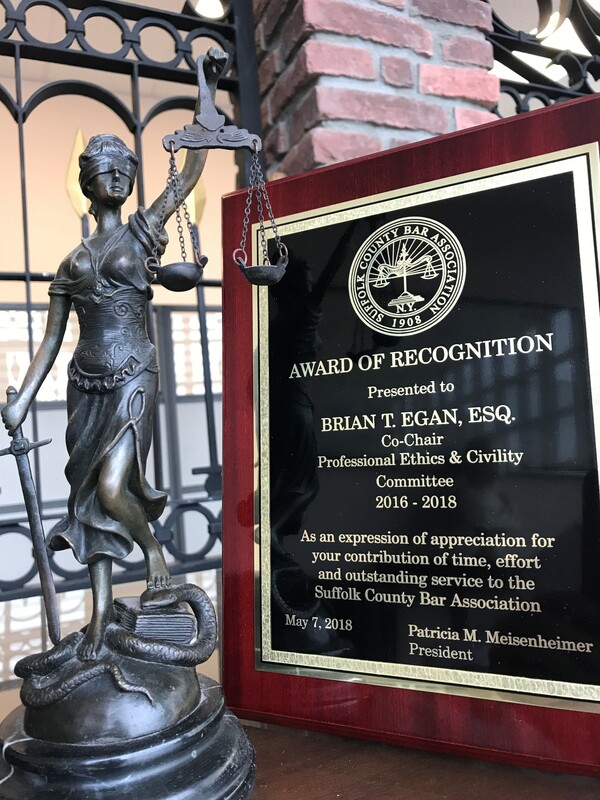 The President and Board of Directors of the Suffolk County Bar Association ("SCBA") has bestowed their annual Award of Recognition to Firm partner Brian T. Egan, Esq. for his service as Co-Chair of the Bar's Professional Ethics & Civility Committee. Egan has served as Co-Chair for two years. This is his second term as Co-Chair, having first served ten years ago in the same leadership role. Egan has served on many SCBA's committees, including Judicial Screening, Grievance, and two terms as Chairman of the Municipal Law committee. Egan & Golden has a strong commitment to the SCBA and its attorneys have served in a variety of leadership roles throughout the organized bar.